This is the thirteenth year that Musicweb International has asked its reviewing team to nominate their recordings of the year. Reviewers are not restricted to discs they had reviewed, but the choices must have been reviewed on MWI in the last 12 months (December 2014-November 2015). The 128 selections have come in from 22 members of the team, the choices this year reflecting as usual, the great diversity of music and sources. The nominated recordings come from 70 different labels, the leading label clearly being BIS with eight. Choosing one recording from all those reviewed in the last months is an impossible task, yet pick one we must. Does one look at the multiply-nominated recordings above? If so, how does one pick between the nine? It is certainly not possible to listen to all the options, for the practical reasons of time and availability, but also one's own personal preferences. What might be unlistenable for one person is the best recording ever for another. Therefore, it seems appropriate to take as read the quality of the recordings and to look beyond that to some greater significance. This leads to the consideration of some of the outstanding recordings featuring composers with birth or death anniversaries. The big names here are Sibelius and Nielsen (150th anniversary of birth) and Scriabin (100th anniversary of death). There are a number of candidates from these composers, but we have opted for a double anniversary choice instead. 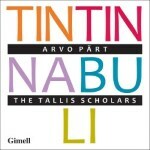 On September 21st of this year, the Tallis Scholars performed their 2000th concert, and in a rare foray into contemporary music, they also released a recording of works by Arvo Pärt in honour of his 80th birthday. As mentioned above, this recording was selected by two reviewers among their Recordings of the Year. What do you want from your musical experiences? I want something that is pulse-quickening, music that is delight-ascendant, a lightning conductor to tears, shivers, smiles or at the very least an experience that is provocative of interest - all those experiences that won me around to classical music in the first place. Applying those far from measurable criteria to the still overwhelmingly numerous recorded harvest has helped in the winnowing process. It has still left me with a large grab-bag of 'almost made-its'. These include Simon Callaghan's 'Indiana Jones' foray into the fascinating world of Roger Coke's piano music (Somm), Shostakovich's fearless and generous Shostakovich Song of the Forests CD (Warner), Louis Glass's Symphony No. 3 (CPO), Chris Howell's Stanford Piano music vol. 1 (Sheva), Pettersson's Symphony 9 (Bis), the complete Scriabin (Decca), the Arnold Symphonies (Chandos), a great bargain and, a real sleeper this: a vivid and even glaringly lit cycle of the Rachmaninov orchestral music (Alto). I hope that the choice for 2016 will be even more challenging with many CD premieres. That's my excuse for some scatter-gun, wild-eyed speculation unfettered by financial considerations. Unleash the hounds! Let's hope for Benjamin Dale's orchestral tone poem, The Flowing Tide, Holst's unaccountably neglected opera The Perfect Fool and his Sanskrit opera Sita, Cecil Gray's Deirdre of the Sorrows, Chloe Hanslip recording the gorgeous violin concertos by Ivanovs and De Boeck, the Coke piano concertos from Simon Callaghan and Somm, Alwyn's massive choral-orchestral work The Marriage of Heaven and Hell, Dett's great oratorio The Ordering of Moses, the three moving cantatas by Yuri Shaporin (all recorded by Melodiya at various times), the symphonies of Pancho Vladigerov, the concertos by Canadian composer Marjan Mozetich, a Chandos recording of the two sumptuous Elgarian symphonies of Healy Willan as well as Joseph Marx's soaring, opulent and intricately lyrical Eine Herbstsymphonie. Perhaps the returned White Hope of Sir Simon Rattle might take another challenging interest in latter-day British music beyond the surface suspects. Surely he will not want to leave this territory to the likes of the gifted and imaginatively inclined Sakari Oramo. Oramo is a conductor whose choices and performances instil a real buzz. His approach to repertoire and music-making is as exciting as those days in the 1980s when Rozhdestvensky headed the BBCSO. As for unsung or little sung conductors I would like to hear more from Oliver Zeffman, John Longstaff and John Gibbons. Gibbons has done so much for provocative and unobvious programmes in Worthing, Ealing and Northampton - who else is programming Rubbra's great Fourth Symphony this season? Lastly let me direct you to two young and overflowingly gifted musicians with the light of adventure and delight still in their eyes. The first is Simon Smith who has recorded Schnittke for Delphian and whose just-issued CD of Silvestrov's piano sonatas should command a high placing in next year's ROTY lists. The second is the saxophone player Jess Gillam. Let's hear this remarkably gifted artist in some saxophone concertos including the brief and seductively flighty Malcolm Arnold and Maurice Johnstone's thoughtful Ballade. Almost surreptitiously, but with well placed confidence, Naxos, undaunted by BIS, have been setting out its own Sibelius theatre-music stall. In this they have collaborated with the Turku orchestra directed by that powerhouse of a composer-conductor Leif Segerstam. The forbiddingly imaginative extensive score for Everyman reminded me on occasion of the enigmas, delights and water-colours of Sibelius' music for The Tempest. The whole of Naxos's Sibelius theatre series is well worth seeking out. It harbours musical surprises and challenges in a sector of the Finnish composer's music otherwise only sparsely recorded beyond a few favourites. More to come. Superbly done.